Unspeak now exists as an “interactive documentary” made in collaboration with SubmarineChannel. There are six video episodes written and narrated by me, each with a different director, plus some cool data-visualization toys. It has been nominated for a 2013 Prix Europa award. Meanwhile more observations on language, in Unspeak and other modes, will henceforth be found in a semi-regular slot at the Guardian, eg most recently the Unspeak of privatization, and Steven Pinker’s trouble with “scientism”. Thanks for reading! Many sentences could have done with extra care: early on, Lysander is seen “staring at a flowerbed in a fearful quandary”, which seems an unwise place to put a flowerbed. Many sentences could have done with extra care: early on, Lysander is seen “staring at a flowerbed in a fearful quandary”, which is an unwise place to put a flowerbed. Personally I feel sad about this “is”. It sounds like I am a pompous pedantic dullard making grand claims to horticultural expertise. You may well think that I am a pompous pedantic dullard, readers, but I don’t actually think I am any good at garden-planning in urban spaces. Maybe it was a poor joke in the first place? But, you know, one poor joke can still be funnier than another. So I am going to put the question to the stern test of blog democracy, or blogcracy. Which word do you think makes the sentence funnier, “seems” or “is”? Please describe your reasons in the comments. Thanks for your “input”! 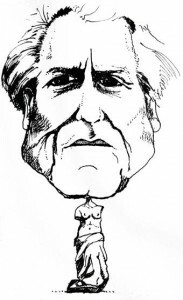 Don DeLillo, one of the world’s greatest living writers, has a new short-story collection out. I reviewed it here; and Martin Amis reviewed it here, gaily wasting the first 500 of his allotted words on a tedious and dubious theory about why when we “love” a writer’s work, that really means that “we love about half of it”. In obedience to his own ridiculous stricture, Amis proceeds to love about half the stories. What is revealing is what he says about the ones he doesn’t love. He complains that DeLillo “enters the void of the motiveless”, which can give us only “a rendering of the functionally insane — insanity being the sworn foe of the coherent”. More importantly, though, Amis’s latest glib reference to (some kind of) “insanity” in DeLillo’s writing seems to me crassly to misunderstand what DeLillo is doing in literary terms. DeLillo is very deliberately writing about (among many other things) the ways in which people’s motivations can be opaque and mysterious, even to themselves. Particularly in the first story, “Creation”, about which Amis whines that “the reader’s naïve and no doubt vulgar curiosity […] goes ungratified”, the fact that the outbreak of the adulterous affair happens utterly without warning — even though the first-person narrator, describing events in the past tense, knows it was coming — is a brilliantly subtle formal way of representing the narrator’s present bafflement by his own past actions, and maybe in a way also his shame. But Amis dully insists that a motive must always be found in literature, even if it cannot be found in life: “Motive tends to provide coherence, and fiction needs things that cohere.” Maybe, if you are writing cartoons or Franzenesque soap operas. For Amis, it seems that people in literature are just to be dismissed as “insane” if their motivations are not spelled out in uppercase crayon so that he, the great Martin Amis, is able to understand them. I hope it doesn’t work like that for him in real life, or it would be terribly hard being Martin Amis, always surrounded by so many mad people. The Economist isn’t impressed with Intern Nation, or any general worries about the increasing practice of making young people (at least those who can afford it) work for free, in times of sharply increasing youth unemployment. But forcing employers to provide pay and benefits and comply with lots of red tape is surely the quickest way to put them off, thereby depriving young people of an early experience of the future of work. The future of work is… unpaid? After all, what are those serial interns doing but learning about serial mastery? They are being trained to compose Schoenbergian string quartets? Excellent! Many people are outrageously exploited at work, but interns are not among them. After all, they are getting a free education, something that few universities provide these days. Thus is the ideal of education shrunk in the philistine mind of the market fanatic to something like “induction into the low-grade activities of a specific job, several times”. And young people are getting this for free from the humanitarian philanthropists at companies that offer internships. ((They’re not actually getting it “free”, of course, once you take into account the opportunity cost of working for no pay.)) After meditating a while on this happy news about what education now means, I deduce courageously that we should immediately close down all the universities. After all, they are expensive, and can be teaching nothing but sophistry and illusion.